Last Friday it was raining, again. That was the case almost all last week, unfortunately. But when it is cold and dreary outside, one of my favorite things to do is bake. And since my two year old absolutely loves helping me in the kitchen, it became a fun project for us as well. I had a craving for bread and since my bananas were not over ripe, I opted for pumpkin. 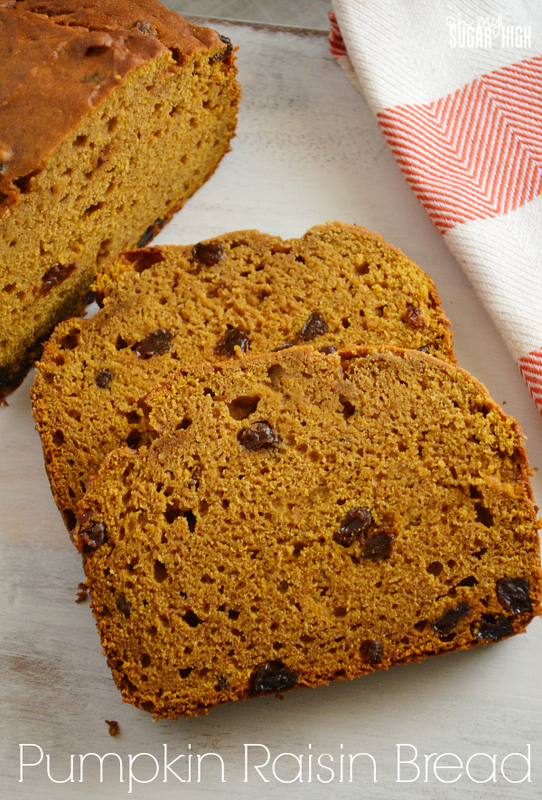 This pumpkin raisin bread does not disappoint, and doesn’t even require pulling out a mixer. You know a recipe is a keeper when you wish you had made more when you are done. 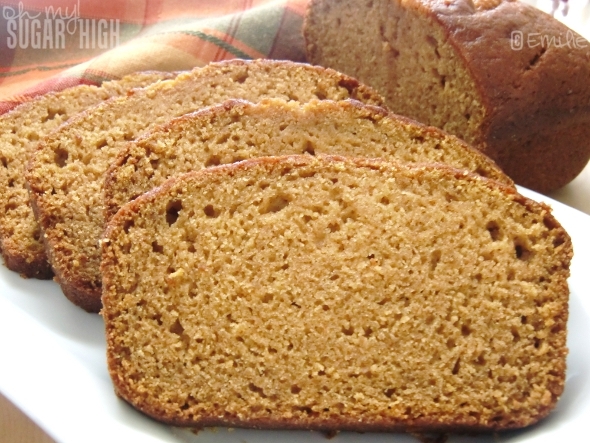 This isn’t usual for me with quick bread since it is one of my very favorite baked goods. But I only had one can of pumpkin so doubling the recipe was not an option. The bread is already gone and now I’m thinking I need to try this recipe with some chocolate chips or dried cranberries instead of raisins. All I know is that as I’m sitting here with a hot cup of coffee and looking at these pictures, I really want another piece of pumpkin raisin bread! 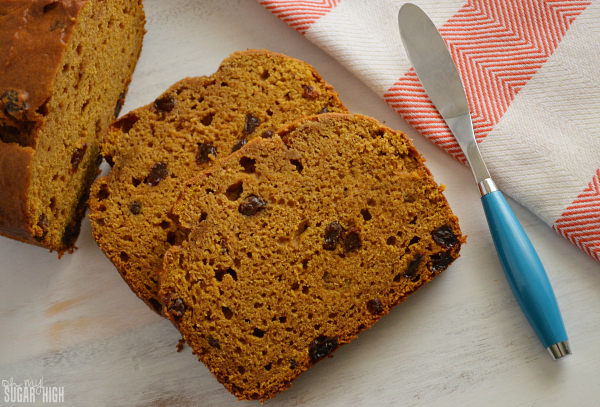 This pumpkin raisin bread will make you one 9×5 inch loaf. Be sure you watch it carefully as it cooks so it gets done all the way through and the outside doesn’t burn. I noticed the bread looking a bit dark, even though the center still was very doughy after almost an hour of cooking so I draped some aluminium foil gently over the top to avoid over browning. It worked perfectly! 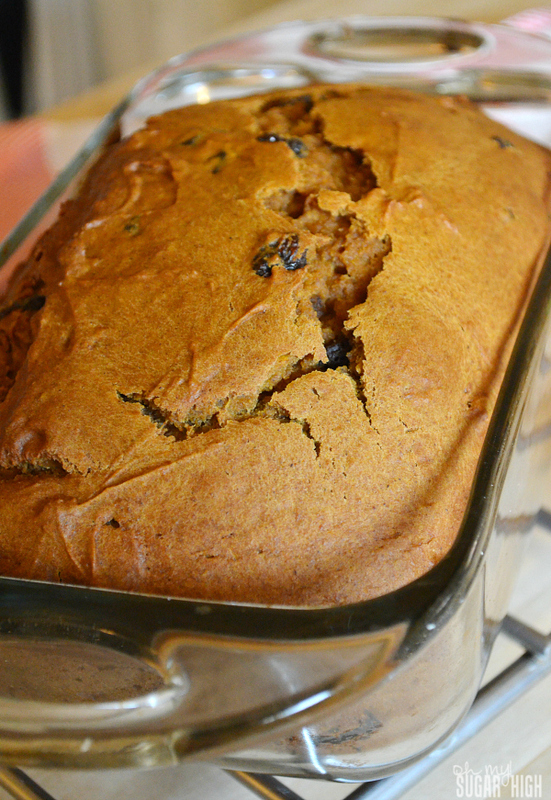 This delicious pumpkin raisin bread is so moist and makes one 9x5 loaf pan. In a large bowl, whisk pumpkin, eggs, oil, white and brown sugar. Set aside. In separate bowl, stir together flour, baking powder, baking soda, salt, pie spice and cinnamon. Stir flour mixture into pumpkin mixture, just until combined. Pour batter into a greased 9x5 inch loaf pan. Cool for 15 minutes before transferring to a wire rack. Cool completely. My entire family loved this bread. We slathered it in butter, although it doesn’t need it. It is super soft, very flavorful and raises up beautifully as it cooks. You really won’t be disappointed with this amazing bread, or the other pumpkin bread recipe I’ve shared. Give them a try!